Based on the Memorandum of Understanding concluded between the Canon Foundation in Europe (CFE) and Kyoto University (KU), the Canon Foundation-Kyoto University Japan-Africa Exchange Program started in 2018. The program offers fellowships to highly qualified researchers in fields of research related to African Studies. 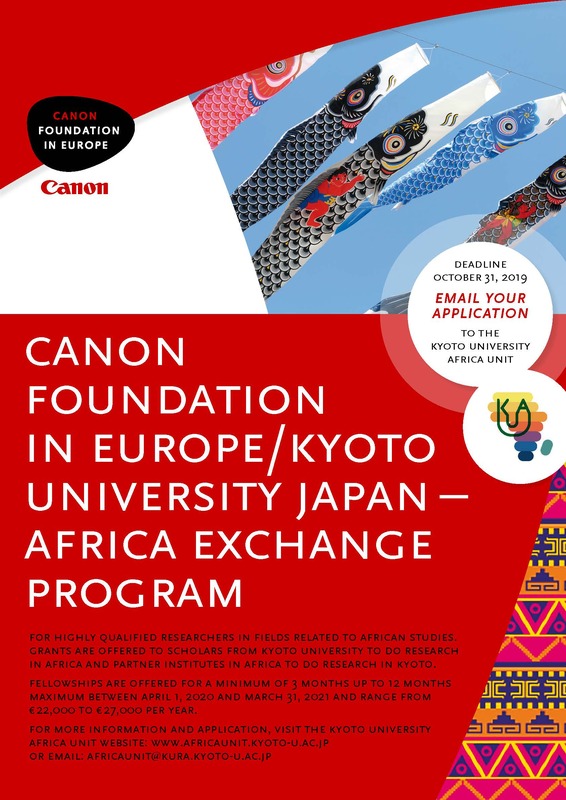 The program is intended to support 1) fellows from KU who want to do research in Africa, and 2) for scholars from Kyoto University’s partner institutes in Africa who want to do research in Kyoto. The fellowships are for a minimum period of three months up to maximum of one year between April 1, 2020 and March 31, 2021. Application deadline is October 31st, 2019. Applicants need to be holding at least an MA degree and employed either at KU or KU’s partner institutions as post-doctoral fellows or faculty members at the time of applying. For a complete list of KU’s partner institutions, please visit its Global Engagement Website at http://www.oc.kyoto-u.ac.jp/agreement/en/. 2 reference letters (maximum 1 page each) from 2 persons. One letter should be from someone in a position to comment on your academic qualifications and professional work while the other should be a confirmation letter from your prospective host who can provide research or work facilities to you during the proposed period. 1 list of your academic publications or professional achievements in chronological order containing information on all authors, place and year of publication and page references. The financial support for successful applicants ranges from 22,500 Euro to 27,500 Euro per year and is pro-rated for different periods. CFE will directly administer the payments and notify the detailed payment procedure to each successful applicant.